CB Passive Income 5.0 Review : Still a Scam in 2019? Hi, It’s Ross again. We are going to review CB Passive Income 5.0. After 5 years in the online world, it is still going strong. There are a lot of reviews about this product, some say it is good and some say it is a scam. We will soon find out. 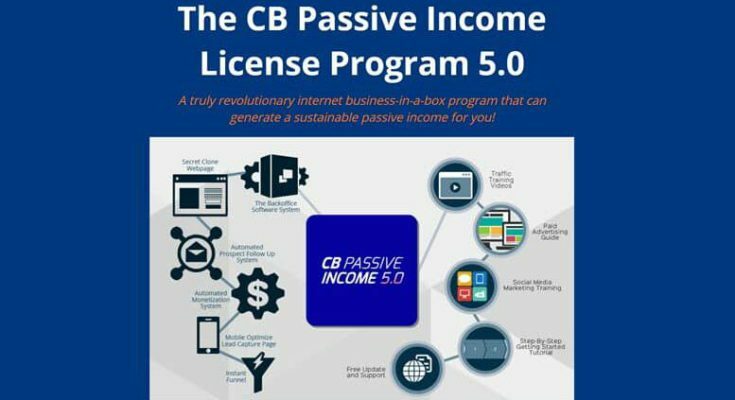 What is CB Passive Income 5.0? Is CB Passive Income a Scam? The CB passive income program is an online system that is designed to help you generate income on the auto-pilot. Once you sign up to this program, you have the right to clone already-made web pages, email, marketing messages and product promotion which been proven to work. The CB passive income was created by the bestselling author of wake up millionaire, Patrick Chan, in the year 2013. Aside the latest version, CB passive income 5.0, we have other versions, namely: CB passive income 2.0, CB passive income 3.0 and CB passive income 4.0. Patrick Chan, the bestselling author of Wake Up Millionaire and multiple other books. He is an internet marketer and the sole owner of CB passive income program. He initiated the online program in the year 2013 and has released various improved version ever since then. Patric Chan is not only an internet marketer, he is also a best-selling author who has few popular books to his credit.These best-selling books are: Clicking Cash which is co-authored by new York Times-bestselling author, Robert Allen, and wake up millionaire. Patric Chan is a click bank super affiliate. Click bank is an online marketplace for digital products. While some individuals view Patric Chan as a scammer, others view him as a messiah. This income program works in a very easy way. Though, most people are not patient enough to earn on this user-friendly platform. After registration you are provided with several pre-made landing pages with free product offers. It is your obligation to promote your landing page through whatever means. You could do so through social media (Facebook, twitter, whatsapp, youtube) or by utilizing paid traffic services. You are free to advertise multiple landing pages simultaneously. Individuals who visit to your page will have to subscribe to your mailing list in order to receive the free product. Patric will forward follow-up emails to your subscribers, this follow-up in emails or newsletters will contain some selected product or offers from an affiliate network clickbank. You earn a 50% commission whenever your subscriber purchase a product. The hardest part of these steps remains the task of generating traffic to the page and promoting the page. One who isn’t good at marketing might find the tasks challenging, but once you get past that hurdle and increase your visitor’s base, you are sure to start earning in no time. There is nothing in this universe that can boast of not having a pros or a cons. Everything has a downside and an upside no matter how copacetic it is. That applies to CB passive income 5.0 program. This is regarded as one of the best advantage of the program. If after registration, you aren’t satisfied with how it works or you feel the program is not for you, you have the right to email the support team and ask for a refund within 30 days. Everything needed to start is already provided by the owner Patric Chan all you need to do is to clone his webpage and everything else he has created. Your obligation is to find whatever possible means to generate traffic to the said webpage. After that you earn a 50% commission on purchases made by your referrals. Patric Chan, the CB passive income owner is reputable man was a clean record. The aforementioned are the reasons why you should give the income program a try. A WHOOPING 50% COMMISSION FOR SALES. For every clickbank product your referral purchase, you will be presented with a 50% commission which is a pretty decent deal! The program also provides comprehensive training and tools to those who are in need of it. You don’t have any control over how the program is ran as it is not yours. So perhaps you don’t like the strategies that Patric Chan is utilizing, there’s absolutely nothing you can do about. It takes time when it comes to making money online. A whole lot of patience is needed. This is a virtue most people don’t have. For an income program like the CB passive income, patient is needed to get the necessary traffics and cases where your referrals refuse to buy products from the affiliate site you have no choice but to wait until a purchase is made. The CB passive income pricing package cost $47 per month and $497 lifetime, inbox pro version included. Personally, I think the fact that some people do not like some features of this product is the reason why such people label it as a scam. Its owner is a well-known honorable internet marketer and a best selling author, so I see no reason why a man so respectable and trustworthy would suddenly want to venture into the business of scamming people through his CB passive income program. Though I say it is not a scam, there are however better platform that will teach you how to really make a living online. See my No. 1 recommended product. I will like to commend the owner of CB passive income for devising such a brilliant initiative where one can earn on the autopilot without much stress. Also, to clear the air on the program being a scam; I think the fact that the program contains an option for cancellation and refund somehow underlines it’s genuineness. Irrespective of what critics have said about the program, I think you can make a lot of money from the program if you are patient and focused. The price for obtaining the package is also cheap, so you get to invest less and earn more! Previous Article 7 Figure Machines Review : Just Another Scam? Next Article CONTENU REVIEW : Content is King Concept!